Houston Dental implants are fast becoming the most popular method for replacing missing teeth. They can easily restore both the look and function of the natural tooth. Many tooth loss patients have found dental implants to be the ideal solution for their tooth restoration problems. However, the success of your Houston dental implants surgery depends heavily upon the experience and expertise of your dental implants surgeon. Don’t trust your Houston dental implants surgery to just any dentist; make an appointment with the Houston dental implants expert at Piney Point Oral and Maxillofacial Surgery today. Dr. Koo is a highly regarded and trusted Houston dental implants expert, proudly serving all of greater Houston, TX, including: Stafford, Meyerland, Bellaire, Lamar Terrace, Galleria, Briargrove, Rice Military, Heights, Bunker Hill Village, Hunters Creek Village, Hedwig Village, Katy, and the surrounding communities. What Are Houston Dental Implants? Houston dental implants consist of strategically placed, biocompatible, titanium posts, which can be used to support permanently cemented dental crowns and bridges or dentures. Houston dental implants add stability to tooth restorations to closely resemble the form and function of real teeth. What Happens During the Houston Dental Implants Process? First, Dr. Koo will perform oral surgery to anchor the titanium post into your jaw bone. This procedure can be done in the dental chair with local anesthesia. The gum is then secured over the implant, which will remain covered until it fully fuses with the bone. This process can take several months to complete. After the bone is fully healed, Dr. Koo will uncover the implant and attach an extension, or post, to attach your tooth restoration (dental crown or denture). In some cases, the implant and post is a single unit placed in the mouth during your initial surgery. Finally, Dr. Koo will fabricate an artificial tooth, dental crown, or denture to be attached to the implant post. In some cases, you may need bone graft or sinus lift surgery, before your Houston dental implants can be placed. What Are the Benefits of Houston Dental Implants? Natural: Unlike dentures or removable bridges, dental implants look completely natural and offer the same chewing force as your natural tooth, so that you can continue to enjoy all your favorite foods. Convenient: Dental implants are also extremely practical. Unlike dentures, you need not remove them, and they can be cared for just like your natural teeth. Durable: Houston dental implants are also permanent. While the tooth restoration on top of the implant may need to be replaced occasionally, the implant itself is anchored to the jaw bone permanently. With proper care and hygiene, your dental implants will last a lifetime. Healthy: Dental implants are also desirable when you have healthy teeth surrounding your missing teeth. Unlike a dental bridge, which attaches to the surrounding teeth, dental implants have no effect on your other healthy teeth. Youthful: Houston dental implants serve to replace your missing teeth, and their roots. This preserves your youthful facial structure by preventing bone recession and loss in the jaw. 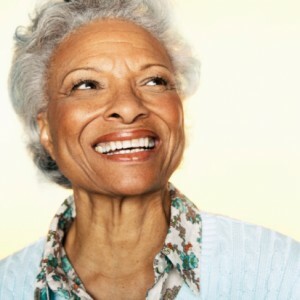 With dentures and dental bridges, your teeth can shift, resulting in an aged or sunken in appearance. For patients with missing teeth or ill fitting dentures, Houston dental implants can renew your confidence to speak, eat, and laugh normally again. If you live in the greater Houston, TX, area including: Stafford, Meyerland, Bellaire, Lamar Terrace, Galleria, Briargrove, Rice Military, Heights, Bunker Hill Village, Hunters Creek Village, Hedwig Village, or Katy, make an appointment with your Houston dental implants expert. Dr. Koo can provide the comprehensive care you deserve, before, during, and after your dental implants are placed.